At times it comes to the point that you realize that you need to improve the security of your property. There are many passive security features that hardware manufacturers have available which will provide a more secure entryway for all types of properties and entryways. Characteristics that strengthen and increase security on locking hardware include but not limited to the following: High security locking cylinders that deter picking and manipulation, hardened cylinder pins and saw resistant bolts that resist drilling, and hardened lock fronts and casings that will prevent a blunt force attack. These are all wonderful features with the intention to protect the locking system, but they don’t address the area around the door jamb. There are two simple and relatively inexpensive physical security solutions recommended by many Reno locksmith companies. those provide additional security to the entryway with the intention of averting a doorjamb attack; these include a latch protector and a security strike. 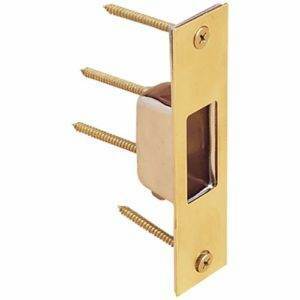 Latch protectors provide additional strength to the door latch and deadbolt. This is not a one size type of hardware, and may at times be extremely difficult to install correctly. If you need stronger protection forced entry upon your door, latch protectors are necessary, but should be installed by a certified residential locksmith in Reno. Installation of security strike plates is a passive security feature that can often be overlooked. Security strike plates are larger and thicker than traditional strike plates and are designed to provide extra reinforcement around the extended latch or deadbolt on the jamb side of the entryway. 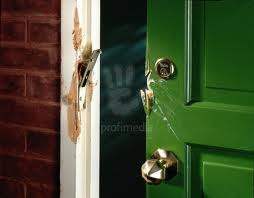 Security strikes can sometimes be surface mounted with the purpose of shrinking the gap between the door and the jamb. Security strike plates are an important component of any entryway security plan and help stop forced entry attempts such as kicking, door prying, jamb spreading, and many other imaginable actions that are intended to take down a door. When you contact a locksmith regarding lock services, you will be able to get more information . When choosing a high security strike plate, give attention to the area of the security strike, or more importantly the length of the strike. The additional length of a security strike plate is that it provides strong reinforcement to something as destructible as a wooden door jamb. This extra security is excellent for any property. Another note to take when deciding on a security strike is the length, position and number of screws that are used when installing the strike hardware. The length of the screws used with a security strike plate is most important. The additional length reduces the chances of the strike plate being dislodged during a doorjamb attack, keeping the integrity of the entryway. Security strike plates are most effective when the screws anchored into the stud are installed in a staggered patterned versus linear pattern. Staggered entry points provide multiple anchor locations at different positions into the stud, which provide supplementary strength and stability to the security strike plate. This feature reduces the chances of the security strike plate from being removed by forcible entry. This entry was posted in Locksmith Tips and tagged deadbolt, door lock, forced entry, latch protector, lock, locksmith, locksmith reno, reno, residential locksmith, security strike plate, strike plate. Bookmark the permalink. © NorthWest Locksmith Reno. All Rights Reserved 2019.